alaTest has collected and analyzed 771 reviews of Amazon Fire HD 8 (2018). The average rating for this product is 4.5/5, compared to an average rating of 4.5/5 for other products in the same category for all reviews. Reviewers really like the camera and usability. The battery and price also get good views. Views about the portability and design are different. Many are negative about the size and GPS navigation. We analyzed user and expert ratings, product age and more factors. 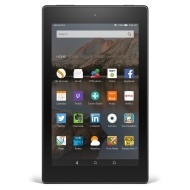 Compared to other products in the same category the Amazon Fire HD 8 (2018) is awarded an overall alaScore™ of 96/100 = Excellent quality. The new Fire HD 8 ships September 21. The 8-inch Fire HD tablet has an HD screen to enjoy free TV shows, movies and games -- if you have an Amazon Prime membership. The plastic design feels cheap. Large games are slow to load and gameplay gets occasionally sluggish. Performance can also lag when downloading apps or video. To truly take advantage of what the tablet has to offer, you need an Amazon Prime membership.